Zoom into the picture above and you will see a face recognizable to many. The mother in the photo is Florence Thompson, most famously known as the migrant mother. This photograph was one in a series taken in 1936 by Resettlement Administration photographer Dorothea Lange. 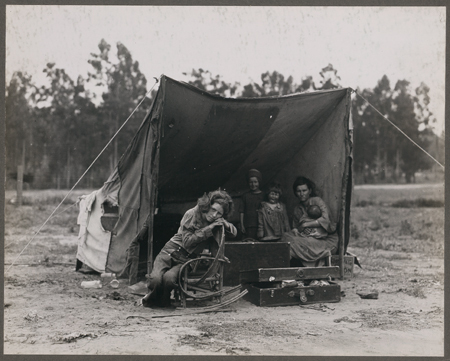 In this primary source activity, students will examine photographs individually and as a set. They will then analyze a variety of primary sources and texts to use as evidence in an essay that defines documentary photography, describes the role of a documentary photographer in sharing stories and shaping public opinion, and determines whether Lange did or did not adhere to the student identified definition and role with the migrant mother series of photographs. Enduring understanding Stories told through various media can be powerful influences. Essential question What is documentary photography and what is the role of a documentary photographer in sharing stories and shaping public opinion? Use the image at the top of this post along with the four below. Click each image to access the bibliographic record and various downloading options. Working individually, or in groups, ask students to analyze an image and complete the activities listed below (student instruction sheet). How does this picture make you feel? What is your initial emotional response to the image? Write down the first 5 words that come to mind when you look at this photograph. Look at this picture again more closely. What details do you notice? What is the focus of the image? How do the framing, angle, and shading affect your view of the image? Write down 3-5 nouns, 3-5 verbs, and 3-5 adjectives that you think describe this scene or situation. Focus on one person in the image. What details do you notice? Imagine that you are this person and write down 3-5 nouns, 3-5 verbs, and 3-5 adjectives that you think describe how this person is feeling. Use your word lists to help you fill out the primary source thinking triangle. When students have finished, arrange completed primary source thinking triangles in groups according to image used. Post the images and associated primary source thinking triangles around the room. Have students complete a gallery walk and note their reactions to student views of the same image and different images in the series. In a class discussion, ask students to share their views on the definition of documentary photography and its role in sharing important stories and shaping public opinion.